A fence is often the first thing a visitor to your Long Beach property will see. Make it count. Hire a trusted fence contractor to help you design a fence to complement your landscape, home or business. An experienced fence contractor will not only help you achieve the best fence for your budget, but also build an attractive fence that is sure to last for years. 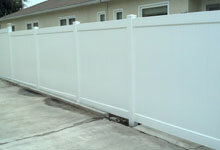 There's no better fence company serving the Long Beach area than J&J Fence. We are a family owned and operated business that is fully licensed, insured and bonded. We have over 30 years' experience in the fence industry, and are committed to customer satisfaction. Our team has perfected the techniques to fabricate and install quality fences made of aluminum, steel, chain link, iron, wood and vinyl, and have the ability to create nearly any types of fence to any dimension and design. 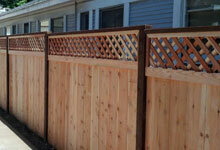 Call Today for a Free Fence Consultation and Estimate in Long Beach, CA; New Customers Receive 10% Off! If you are looking to invest in a new fence in Long Beach, you may be wondering where to start. There are so many options. Instead of spending hours researching fence styles and the pros and cons of various materials, talk to one of our fence specialists. We will come to your Long Beach site and listen to your needs. We can show you a number of options that fit your budget, requirements and style, or will help you develop a sketch. Once you settle upon a concept, we will give you a complete quote that will let you compare it to other vendors in the area without feeling any pressure to work with us. We work with wrought iron, security iron and ornamental iron to create fences, window bars and handrails in Long Beach that emanate Old World beauty. We can create designs that are elegant in their simplicity or wondrous in their intricacy. Call today to explore some of the possibilities. 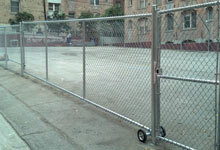 Our chain link fencing is perfect for homes, businesses, kennels, tennis courts, backstops and more in and around Long Beach. We can even accommodate the needs of high security facilities with our chain link fences that feature barbed wire and razor wire along the top. We use the industry's best practices for creating sturdy, long-lasting chain link fencing, and offer a variety of options for personalization, such as privacy slats, security access controls, ceilings, and locking mechanisms. J&J Fence's custom fence builders are able to build the complete range of wood fencing: picket, ranch rail, stockade, wood with iron, tongue and groove, shadowbox and more. Clients can choose between redwood and cedar, and work with one of our designers to explore the best height, width and spacing of pickets and rails to suit your home or business. 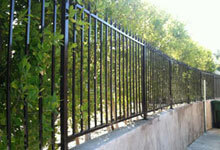 Providing Long Beach clients a low maintenance alternative to wood fencing is our vinyl. Vinyl can be made to mimic wood, but has a more pristine look. It also comes with a lifetime warranty and is guaranteed never to rot, peel, blister or flake. 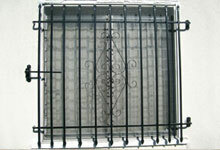 J&J Fence completes almost every Long Beach fence with a corresponding gate. We are able to build a gate in nearly any designated space and can customize the gate with special features such as cantilever rollers, swinging hinges and latches, motorized operators or access control systems. We even sell and install roll up doors and folding gates, which are popular with shops that have large storefront windows or loading docks that open directly into their storage area. 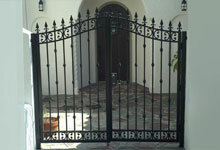 This swinging iron driveway gate in Long Beach, CA adds privacy and style to this home. 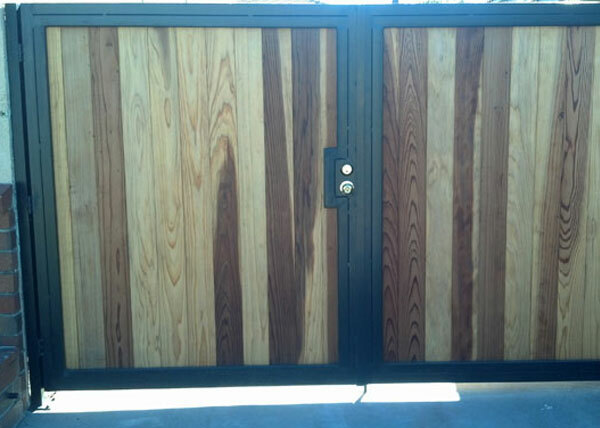 The 6 ft tall driveway gate features redwood vertical privacy fence boards and an iron frame.